Since I was a child, Reading and Writing have always been something that I have enjoyed. I can remember, as a young girl, going to the library with my dad and picking out books to take home. It was always an exciting time. Both of my parents would read to my brother and I before we went to bed. I know that this is a huge reason why I enjoy reading today. Whether you sit down with your toddler and look at a picture book or if you read the same Dr. Seuss book over and over again, reading is something that a child can LEARN to enjoy. 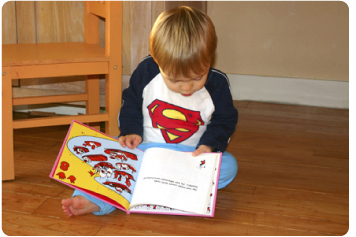 Follow your child’s interest – if your child enjoys pretending to be a superhero, then look for superhero books. If your child likes dinosaurs, then get them a book about dinosaurs. Providing them books about things they like will definitely spark their interest in reading. Find an Interactive Book – Some of my favorite interactive books are the “Look and Find” books where you are instructed to find certain objects on the page. They get so excited trying to be the first one to find what we are looking for. Take your child to the library. This is big for us. As I said in the beginning of the post, the library was a huge influence on sparking my interest in reading books as a child. I wrote a post a while back called Library Books are a Special Part of our Daily Lives. Be sure to check it out. Those are just a few ways that you can get your child interested in reading books. And even AFTER your child learns to read, it is still important to read TO them. 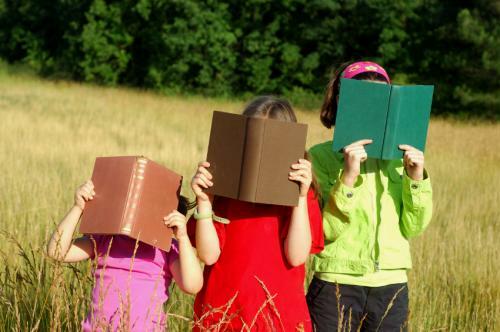 When you read a book to a child they are more likely to pick up that same book later on and read it themselves. Children also like to read what they CHOOSE to read, so allow them to pick a book the next time you sit down to read together. And another key point is that children who enjoy reading, actually do better in school. As they get more and more comfortable with reading at home, they will be more comfortable and have a better self esteem about reading in school. This bit of info really helped me to understand the importance of reading with my children and I hope that it will also help you as well. How about you? Do you read to your children? Do you go to the library? What reading rituals do you have in your family? I would love to hear your comments! I am doing a citation for your website but do not see a copywrite date on here, can you help me out? Sorry about that. I went ahead and updated it.